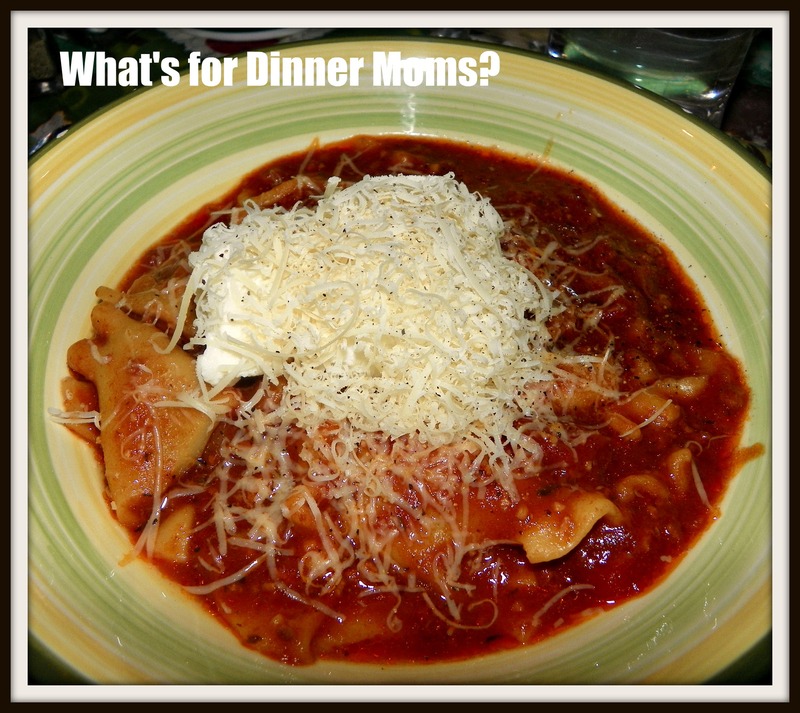 Slow Cooker Lasagna Soup – What's for Dinner Moms? Here is a repeat posting of one of our most favorite hearty slow cooker soups. Has great lasagna flavor without all the fuss! Enjoy! With the weather still below 0 in the mornings every day sounds like a great soup or stew day lately. I have found a bunch of tasty sounding soups and stews on Pinterest and have started to make them one by one. I love that most of them take little effort on my part and at the end of the day my house smells wonderful and I have a delicious dinner to put on the table. I LOVE lasagna but do not like spending a whole day boiling, shredding, frying and baking. I do it occasionally but it has to be on a weekend and it is usually at the request of another family member. I was very skeptical of this recipe for Slow Cooker Lasagna Soup from Tablespoon.com. Again, I didn’t have all the ingredients on hand and since I am in a N0-Buy month for January (still saving for that vacation!) I decided to make it my own by using what I had in my refrigerator and pantry. It was delicious. It had all the right spices and adding a bit of ricotta to the bowl with freshly grated parmesan made it like a small bowl of lasagna. I served this with a green side salad and the leftover dinner rolls from last night with garlic butter on them. Both kids loved it and each ate two bowls. There was enough leftovers for 2 dishes the next day but I learned when left to sit overnight in the refrigerator it turns from soup into something that looks like Chef Boyardee from a can. My son ate it heated up with a fork. It was still fine but it was no longer soup. Brown sausage in a medium skillet over medium heat. As it is cooking break up sausage into small pieces with the side of a spoon. Once sausage has cooked through completely remove it from the pan with a slotted spoon and place it on a plate covered with paper towels to soak up some of the extra grease. Return the pan to burner and lower the heat to medium low. Add the diced onion. Allow to cook until starts to turn slightly brown at the edges. Add garlic and cook stirring occasionally for 2-3 minutes. Add 1 cup of chicken stock to the skillet and stir up all the little bits of brown stuff off the sides and bottom of the pan. Add sausage to the slow cooker. Slowly pour the pan with the onions, garlic and chicken stock mix over the sausage. Add tomato sauce and spices to the slow cooker. Stir well and allow to cook on low for 6 hours. One hour before you are ready to serve your soup taste for appropriate spiciness and adjust spices and thickness to your liking. Then add lasagna noodles. Stir well cover and cook for 50 minutes to 1 hour. Remove 3 bay leaves from soup. Serve soup with a dollop of ricotta cheese, a sprinkling of Parmesan and a bit of ground black pepper over the top if you wish. I wonder if that would work with spaghetti or other pasta noodles? Sounds lovely. Glad your family liked it. I finally made a version of this last month, yummmm! When I saw the recipe again I thought I need to make this again too! I love the zesty broth versus the creamy ricotta. Thanks! I love that you can make it as spicy as you like. My son adds extra garlic and oregano to his bowl because he loves the additional flavor.